Early in the morning of July 14 2014, I had a dream that I was with other people outside. I was facing them and they were all facing me. Suddenly I saw the look of terror on their faces as they looked up behind me. I turned around and saw a huge tsunami. It appeared to be about 11 stories high! It was about to crash down upon us. I only had a moment to glance up, then I leaned in to the rocky cliff-like area I was standing next to. I started praying and praising God. The tsunami was at my back at that moment. I looked up and saw it was still at my back and crashing above me, but there was an area of protection that surrounded me and stopped it from touching me. I knew it was the LORD. He did not allow the water or waves to touch me at all. As I stood there leaning on the rock, even as I was surrounded by the water I was still able to look up and see the blue sky because the water and waves were not allowed to go near me. All of it went completely around my little area! The next moment I became aware that people were getting ready to have a funeral for me because they thought I had died in the tsunami. The tsunami had passed and I was now up on top of the cliff sitting in the backseat of a car. I stepped out of the car and yelled down to the people, “I am alive! I am alive!” They were astonished. Then I woke up. Then I went back to sleep after a while and had another dream. In this dream I was in what appeared to be a classroom or church setting. I saw myself writing down what I had just dreamt about the tsunami. Then I put a star to the left of it and wrote “CRITICAL” near it. I had several other things I wrote, but dreaming about writing down the tsunami dream let me know it was significant and important. 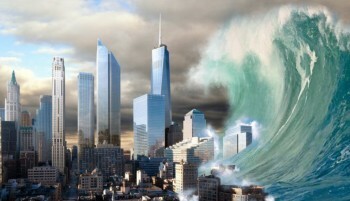 What I sense is the tsunami represents something that is going to come upon the earth suddenly, unexpectedly, and that nobody can stop. The rocky cliff is the Lord. Those who lean on the Lord for His protection are going to see whatever is coming, but it will not harm them. Even in the midst of the trouble, they will see clearly through to the heavenly realm because of their relationship with the Lord. Hi Linda. I have been pondering your dream of a tsunami for a while ever since you put it up. Do you think it is both literal and a metaphor ? For those who live near the coastline, they may receive literal supernatural protection and will be a great testimony to the world of survival. For those who live inland, I have been thinking along the lines of a metaphorical interpretation according to Psalm 91 – when there is bad stuff going on all around, those who dwell in the secret place (ongoing relationship with the Most High), they will abide under his shadow. Maybe your saw that protection (91:1) in a literal way in your dream ? Hello Bryan, I’m sorry I just now saw your comment from months ago. I do believe there will be literal, supernatural protection for some. . . others will be singing joyful choruses in Heaven, for it’s their time to go home . . . sadly, most are not ready and are heading into eternal damnation. I do believe we will see some amazing, supernatural events take place on our behalf, from our Heavenly Father. Thank you, Cherie Miller. Prayers are needed. The spiritual warfare has been fierce, as most believers have been experiencing. It’s not easy to “put yourself out there” . . . I did this reluctantly, but out of love and obedience for Jesus. May each one of us have the courage to “step out of the boat” and follow the leading of the Holy Spirit, that will take each one of us outside of our comfort zone. Please feel free to share, as led. You are welcome, Brenda Brown, and I agree with you. I sense things will be “and suddenly” and I’m not talking about the rapture, either. To be ready as a Bride of Christ is intense . . . the “refiner’s fire” that made a lovely song is not so lovely when going through it. ALL that is blocking our full 100% relationship with Jesus will be shaken/removed. The MERCY of the Heavely Father is to shake all that can be shaken and to have us go through a refiner’s fire now, than to be in everlasting torment in the lake of fire. Since yesterday (7-28-15) I have been feeling the “fear of the LORD”, like never before. It’s still with me today, as I’m typing out this comment. What I understand now, is this is the anger of the LORD, towards all of the ungodliness/sin that has been increasing in the world. I’m also feeling the fear of the LORD for those who consider themselves “awake” and ready, but are like the 5 foolish virgins. . . they are not ready, because they do not have that intimate, in-love, bride waiting for her bridegroom TRUE love for Jesus. Only the Holy Spirit can help us with that, so we must keep pushing in, fasting and praying, to get ALL that is unholy/sinful out of our lives. To repent, where we need to repent and the biggest barrier? Forgiveness. . . to forgive ALL and fully (again, only the Holy Spirit can help us with that because we think we may have forgiven, yet still have not fully forgiven). I say this: FATHER HELP US TO BE READY, IN JESUS NAME. . . AMEN!! Hi again Linda Clay. I just wanted to add regarding that tsunami dream, that it foretells of extremely trying situations and circumstances that will befall people ‘out of the blue’. God is doing this in this day because we must be pushed beyond our human nature in order to let go of it, and take hold of Christ instead. This is essential in the Bride making herself ready. We have to have let go of our humanity to truly identify with His divinity. Sorry I didn’t say this earlier, but having thought of it now, I think these it’s good to say them because so many don’t really get what it will take to be rapture ready. Thanks for your comments.